Maghreb Blog: Le Journal Hebdomadaire n'est plus! Le Journal Hebdo has been shut down. Yesterday, 5, yes, 5, bailiffs showed up armed with a court decision to take over Le Journal Hebdomadaire and the company behind it, Trimedia. 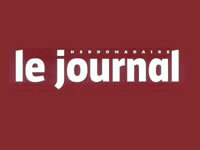 The only link is the title: "Le Journal Hebdomadaire" but the title is owned by the publisher himself not the company. Although we are waiting to get a clearer legal picture, we can already officially announce the death of Le Journal Hebdomadiare. The closure marks an end to the magazine's tumultuous 12 years of conflict with the authoritarian apparatus of the state in Morocco. Le Journal's assets were seized in 2002 after the court ruled in favor of former Minister of Foreign Affairs and ex-Ambassador to the U.S., on whom the magazine published an article contending his purchase of a house in Washington DC. The ruling is the final death nail in the coffin of the much maligned and bold magazine. Since its first issue appeared in November 1997, Le Journal and its editor Abu Baker Jama'i left no sensitive political or social issue unperturbed. From its highly controversial reportage on the Western Sahara conflict to the sluggish pace of political reforms, the weekly magazine quickly established itself as a watchdog calling for greater government accountability, and more meaningful political and democratic changes. Le Journal engaged in several bouts with the state in its attempt to exercise freedom of expression and the press. and it was banned several times notably after its publication of a letter by former Union Nationale des Forces Populaires (UNFP) leader alleging the complicity of the Union Socialiste des Forces Populaires (USFP) (then party in power of PM Youssoufi) in the failed putsch against late King Hassan II in 1972. The closure of Le Journal is yet another indication of the dwindling threshold for journalistic expression and dissent in Morocco. In addition to excessive fines and seizure of assets, the strategy of the state to stifle freedom of the press was perfected through a repressive press code and an advertising boycott against the magazine that drove Le Journal and Jama'i to bankruptcy. As political and economic reforms continue to be anemic, the state appears to be less tolerant vis-a-vis any form of dissent, and perhaps the state has also finally settled its account with the 12-year thorn of Le Journal in its side.